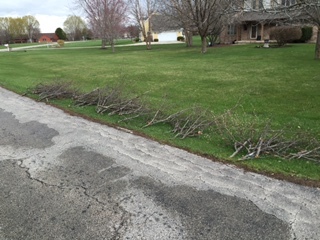 The Campton Township Highway District offers brush pick-up as a courtesy service to residents in the unincorporated areas of the Township. These guidelines are for expediting brush pick-up and preventing injuries to our crew. The Township has not been instructed by Kane County to provide this service and the Township is not reimbursed by the County for the cost of supplying this service to its residents. Therefore, we ask for your cooperation in following the guidelines. If you do not meet the following guidelines your brush may be “red tagged” and the problem will be indicated on the tag. If you make the proper corrections your brush will be picked up. The Campton Township Brush Removal Program is for the homeowner’s convenience. We have a brush chipper designed to chip small limbs and branches that do not qualify as yard waste. Our equipment is not designed to grind small twigs and evergreen trimmings. Your garbage service will take yard waste and roots for nominal cost. IF IT CAN BE PUT INTO A BAG, THEN IT IS YARD WASTE. WHEN: Brush pick-up begins according to our announced brush pick-up schedule. It takes approximately two weeks to pick up the Township. Pick-up will be done over a two-week period, weather permitting. Areas in the township on the North side of IL Route 64 will be handled the first week, and areas South of IL Route 64 will be handled the second week. Inclement weather will delay progress for each day work cannot be done. Any other pick-ups will be subject to the Highway Commissioner’s discretion. WHAT: BRUSH IS HEREBY DEFINED AS TRIMMINGS FROM BUSHES OR SHRUBS, AS WELL AS SMALL TREE BRANCHES FROM TRIMMING AND/OR PRUNING TREES. NOT CONSIDERED TO BE BRUSH are FIREWOOD, LOGS, CLEARING THE FOREST FLOOR, ROOT BALLS (NOT DIRT), STUMPS, GRASS CLIPPINGS, FLOWERS, WEEDS, PLANTS, LEAVES, LUMBER OR ANYTHING IN PLASTIC BAGS OR OTHER SUCH CONTAINERS. This brush pick-up program is for the sole use of the residents of unincorporated Campton Township, and shall not be used by contractors and/or residents clearing lots for homes, private roads, entrances, or acquiring more open space. 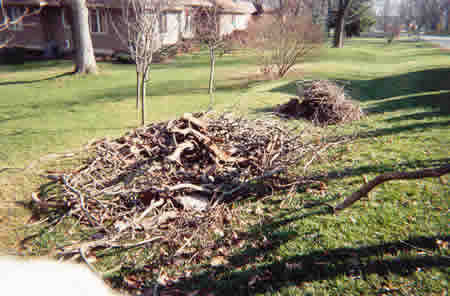 CUTTING DOWN A TREE OR LARGE HEAVY LIMBS IS NOT CONSIDERED TO BE TRIMMING OR PRUNING AND THE TOWNSHIP WILL NOT REMOVE THE DEBRIS. GUIDELINES: Each brush pile MUST BE SIZED FOR AN EASY ONE PERSON PICK-UP. They shall be placed on the edge of the road by the Saturday and Sunday before the scheduled Monday pick-up in the area. Do not “hide” thorny tree branches inside piles. If you have thorny brush, it must be bundled and tied with string or twine and placed in a separate pile. Small pencil-sized twigs, as well, should be bundled with twine or string. These bundles must also be an easy one person pick-up. Place these bundles with any other trimmings next to the road and our crews will take them. They need special care; they can cause injury. 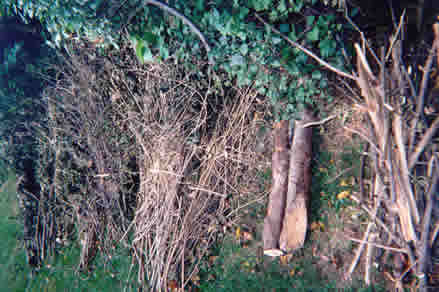 These are examples of good tree and shrub trimming brush piles. 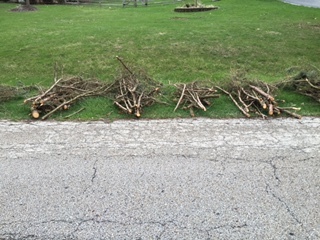 The branches are sorted by size and bundled into groups for easy one person pick-up. Please try to bundle your brush like this example. NOTE: DO NOT tie any brush into bundles using wire; INSTEAD use string or twine. All brush must be cut in lengths up to (8) feet and no bundles larger than 18 inches in diameter. ALL BRUSH MUST BE PLACED WITH CUT ENDS FACING THE ROAD PILED NEATLY AND EACH BUNDLE MAY BE TIED TOGETHER USING ONLY STRING OR TWINE. Piles should be spaced 1 or 2 feet apart. This looks like it could be a beaver dam when actually it is a brush pile that does not fit the guidelines. 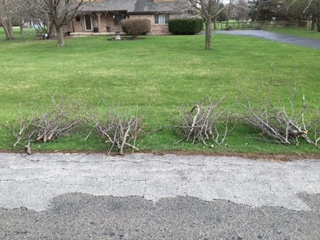 Remember to neatly organize the brush with the cut ends facing the road and space them far enough apart for easy one person pick-up and handling to prevent serious injuries to our crews. STORM DAMAGE: After a SEVERE STORM the Highway District will pick up storm damage (Brush and Branches) provided the resident notifies the Highway District to be added to the Pick- Up Schedule within 10 Days of the storm. The storm damage WILL NOT be picked up if resident fails to contact the Highway District within the 10 Day period. Please call: (630) 365-9300. A SEVERE STORM is a storm producing enough damage that the Township road crews need to clear THE ROADS AND THE RIGHT-OF-WAYS of Storm Damage for traffic. Please follow the brush pick-up guidelines. SHOULD A TREE COME DOWN DURING ANY STORM ON PRIVATE PROPERTY, IT WILL BE THE RESPONSIBILITY OF THE HOMEOWNER FOR ITS PROPER DISPOSAL. WOOD CHIPS ARE AVAILABLE FOR PICK-UP at the Highway District outside the gate.